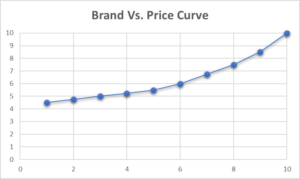 I’m working on a two day workshop program for a local non-profit and recently, when we met to discuss the curriculum, the conversation turned to “Brand Value versus Price Value”. Brand is a concept we have explored quite often in this column space in recent months. As you know, I think of Brand as the holy grail of business success. Brand is, in my opinion, the only reason why you are either succeeding or struggling to succeed in business. When we start digging into Value, we deepen our understanding of how Brand Value and the perceived Value of our goods or services are linked directly to the most important aspect of business success, Revenue. If Brand is the culmination point, what lays beneath it? Very much like that Iceburg picture we’ve all seen, Brand is the tip, and all of the facets of your business are what lay beneath the surface that no one sees. There are significant contributors to brand that we have outlined in prior columns: supply, quality, merchandising, store layout and cleanliness. However, there is one quality which determines the sale-ability of your goods or services more than any other: You. As an owner operator, sales rep, or even receptionist, it is your actions which determines most significantly what someone will be willing to pay for your goods or services. It is who you are, what you do, the way you behave that determines the amount of money people are willing to pay to do business with you. 1) You go into a luxury car dealer. You marvel at the workmanship, savor the way your hands feel on the steering wheel. But the salesman is creepy. in fact, he has a whiny voice, is constantly harassing you with too much information, is poorly dressed, and comes across as a bit unprofessional. does you receptivity to the sale shift? might you look for another salesman or a better deal? If the sales persons brand is strong, they are well dressed, stand at a distance, answer politely and facilitate the sale, your receptivity to both the sale and the price goes up. 2) You are dining in a restaurant, and the owner comes up to you and throws the menus on the table casually and then turns and leaves. You have to ask him to come back and take your drink order and he says “Hurry up, I have other things to do” (true story). You and the person order off the menu, and the food comes. Its ok, not great. Every time the owner (the only person in the restaurant) comes by, he appears angry, he’s impatient. Its like he can’t wait for you to leave, so he can do something not customer focused. … What’s more evident is that his business is suffering; you two are the only ones in the restaurant at lunch time. You get the bill, it’s 25.00 and you think “that sucked” as you walk away. In both of these scenarios it is the individual that makes the difference on perceived value for the customer. If the customer is treated well; if the owner or staff person is kind, respectful and considerate; if the product is delivered in a way that respects the customers’ needs then the chargable price for that product increases because people see the value of doing business with the person and business. When you expect the world to just respect who you are, or accept that you are grumpy, or “I’m moody so what?” you are disrespecting the needs and wants of those who come to purchase from you. One of the things I’ve learned in my years of business experience is if your customers don’t feel valued, don’t feel important, or don’t like you, they will find an alternative to you. What can you do to build personal brand? 1) Build The Relationship – see every person as a customer and think about how they can help you achieve success. Imagine they have the purse strings to your success, because they do. 2) Train – never stop training, reading, developing. That goes for both your team and yourself. Always seek greater understanding and tools to serve your clients. If you are learning you are growing and people are drawn to growth. 3) Revamp – know when to redecorate or revitalize your business. Know when to change staff, products or how you serve your client. If sales have fallen off more than a two months consecutively, its time to look at why. 4) Rebrand – revitalize your signage, your social media posts, your advertising. Make the old new again. 5) Be a Servant of your Clients – If you serve your clients, are considerate of their needs and value them, they will value you. A great example of this is Faith from Moon Wok. She welcomed us to her newly renovated restaurant, paid attention to our needs, sent us chocolates at Christmas…. she paid attention to us as clients. As a result I have posted pictures of “Cheesy Wontons” at least three times (soooo good), recommended the restaurant many times and taken clients there often. It’s more than “just a Chinese restaurant” because we are treated like more then “just a customer”. To conclude, how you appear as the Brand Ambassador for your business, in the eyes of your customers, directly impacts the health of your revenues in your business.